Flying fifteen boat project for sale. Complete with sails, mast, boom, spinnaker poles, sheets, anchor, etc. In need of repainting to deck. Original gelcoat hull. Dry stored. Minor work to inside, repainting and tidying. Trailer is not roadworthy, used as cradle. Still a good boat, lack of time to refurbish, Great Project. Bit of an update: I have secured lifting equipment to lift the flying fifteen and its cradle onto a road trailer, car transport trailer recommended. 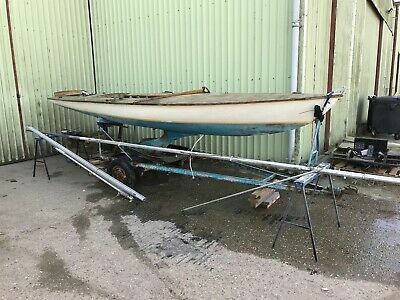 This Sailing Boat Projects boat is located in Dorchester, DT2 8AU and is being sold on eBay by sageonion2.